Bay Area's Custom Interior Designer | Best of Houzz! I am a full service, certified interior design firm focusing on residential design and remodels: schematic design, construction documents, building permit package, and interior design. I have been in this business since 1997 and specialize in major Kitchen, Family room, dining room & bathroom additions and renovations, with an emphasis on sustainable design. I also specialize in Mid-century design & furnishings. At Diedre Shaw Interiors, we believe that homes are sacred spaces, and should be designed with this in mind. Though each project presents a fresh creative challenge, our intent remains the same: to create interior spaces that exceed your aesthetic expectations, allowing you to live with pleasure, grace and ease. Our firm delights in making the process of interior design enjoyable, enlightening and accessible. We work in concert with your vision and our ideas, using our expertise to actualize what is always our goal: a beautiful, inviting interior that ultimately expresses your highest aims for your home and your life. San Francisco Leading Interior Design Firm 3x Best of Houzz Winner! 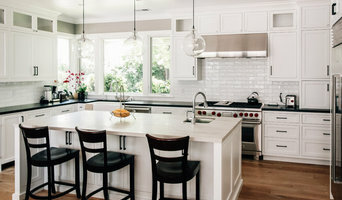 Best of Houzz 2014 - 2018 Kerstin Dieterich Designs is a full service design firm working on a variety of projects - from design consultations to kitchen and bath remodels to complete new construction. Located in San Carlos, California we enjoy projects from San Jose to San Francisco and Sonoma and Napa. Our dedicated team is here to assist you with your project by offering guidance from the initial design idea to the completed project. The goal is to create original designs for our clients, always with a thoughtful approach that can be enjoyed for a long time. As a certified interior designer with over twenty years of experience in the industry, Kerstin sees herself as a facilitator between the homeowner and contractor. Open communication with the client and collaboration with other professionals involved is key to demystifying the construction process. We strive to make the project an easy and enjoyable journey that results in a beautiful and functional space. We are looking forward to discuss your project with you. Since 1975, Michael Merrill Design Studio has been creating beautifully pared-down environments that are deceptive in their simplicity. From The San Francisco Decorator Showcase and Manhattan penthouses to the careful restoration of the historic Bernard Maybeck home in Northern California, our work can be seen in the renovation and design of residences in numerous settings. Every project provides an opportunity to create a unique and remarkable solution. We enjoy working in a wide range of styles from traditional to contemporary, rustic to sleek. It is always our hope to find projects where the client is engaged and a part of the design team. Our design approach is as much about what is left out, as what is included. This approach requires that each design element be carefully chosen and meticulously executed. The resulting space is meant to convey a feeling of warmth, comfort, and well-being. I love the challenge and impact of effective, personalized home design. In addition to exterior design and interior applications of color, light, texture, and layout, I consider practicalities of storage, organization, usage patterns, and competing/changing needs to deeply inform my approach. From developing a vision of their home, that can unify and encompass landscape, interior, and facade, to producing architectural drawings for permits, and collaborating with contractors and artisans, I can support clients from initial ideas through to realization. My prior background, with eight years of user experience and technology consulting, lends me additional agility and insight into uncovering and designing for client needs. Led by Principal Designer, Risë Krag, ALLIED ASID, LEED AP - RKI Interior Design is an award-winning, upscale interior design firm headquartered in San Carlos, California. RKI is known throughout the San Francisco/Peninsula area and Silicon Valley for its high-end residential and commercial design. With a team of mid-Peninsula natives, the entire RKI staff is intimately experienced with its area, specializing in the needs of the local community. We are proud to have built a reputation of trust and knowledge in our niche demographic; throughout the cities Hillsborough, Woodside, Atherton, Palo Alto, Menlo Park, Portola Valley and more. RKI is known for ground-up building and transforming homes into something sophisticated and timeless. We pride ourselves in managing projects from the blueprint to final move-in and décor. Our talented team of professionals provides personalized, flexible service and availability, especially during the build and construction process and ensure every project is not only seamless but a pleasure for our valued clientele. Feel free to contact us for a complimentary phone consultation; we would love to hear from you. ___ Kitchen $65,000-$200,000 Powder Room/Bathroom $15,000 – $70,000 Living Room $30,000 - $100,000 Bedroom/Single Room $45,000 – $85,000 Outdoor Room $15,000 - $30,000 New Home (Ground Up) $3.5Million – $10Million Whole Home Renovation $900,000 – $2Million Home Additions $250,000-$600,000 Custom Drapery and Window Coverings $2,500 - $12,000 per treatment Motorized Shades $7,000 - $15,000 CAD Drawings $5,000 - $65,0000 Lighting Design $5,000 - $20,000 Cabinet Design $5,000 – $20,000 Specification Packages $10,000 - $15,000 Paint Color Selection $2,500 - $5,000 Consulting $10,000 - $25,000 3D Visualization $5,000 - $25,000 Art Consultation and Selections $10,000 - $25,000 *We offer custom furnishings, window coverings, bedding, linens and décor. Your actual costs may vary based on the scope of your project. We offer a complimentary ½ hour appointment at our office. In-home consultations are charged, starting at $150 per ½ hour. A good home design professional will hone your style down to its very essence and be able to choose a functional layout that feels natural to you. Interior design companies can be involved as much or as little as the client desires. Many clients who hire an interior decorator in Highlands-Baywood Park, CA — particularly those who are remodeling — have a good sense of how the room should look and what products they should use. Often clients will insist that interior decorators use the products already present in the house. Other times a designer will need to start from scratch — especially if this is a newly purchased or just-built home. An interior design company will need to figure out exactly what the client needs, which includes organizing rooms, picking flooring and wall colors, and finding furniture to complement it all. Sometimes that means he or she will have to recruit help from other Highlands-Baywood Park, CA home professionals to help create the perfect look for your renovation. Here are some related professionals and vendors to complement the work of interior designers & decorators: Architects & Building Designers, General Contractors, Home Builders, Design-Build Firms, Photographers. Do your research before meeting with an interior designer or home decorator in Highlands-Baywood Park, CA. Ask yourself what you want your space to become and what it will be used for. Figure out the extent of what you need help with, what your must-haves are and what your budget is. Interior design services can add up fast, so be up front with a potential design firm or individual from the beginning. Also, pick an interior decorator that fits your style. Browse through the portfolios of different Highlands-Baywood Park interior design firms and decide if you would live in those houses. Just because you like something doesn’t mean you could live in it. There's a big difference! Find an interior designer or home decorator in Highlands-Baywood Park, CA on Houzz. Narrow your search in the Professionals section to find Highlands-Baywood Park interior designers near you. You can also look through Highlands-Baywood Park, CA photos to find a room you like, then contact the design firm who designed it.